I am a list-maker at heart, so when summertime comes around I am secretly thrilled at the opportunity to make a new list to help my children organize their days. This summer our lists come in two pieces: a Household Work chart and a Daily Must Do list. Keep in mind that my children are ages 12, 9, and 7 (the 2-year old is currently exempt from the list). 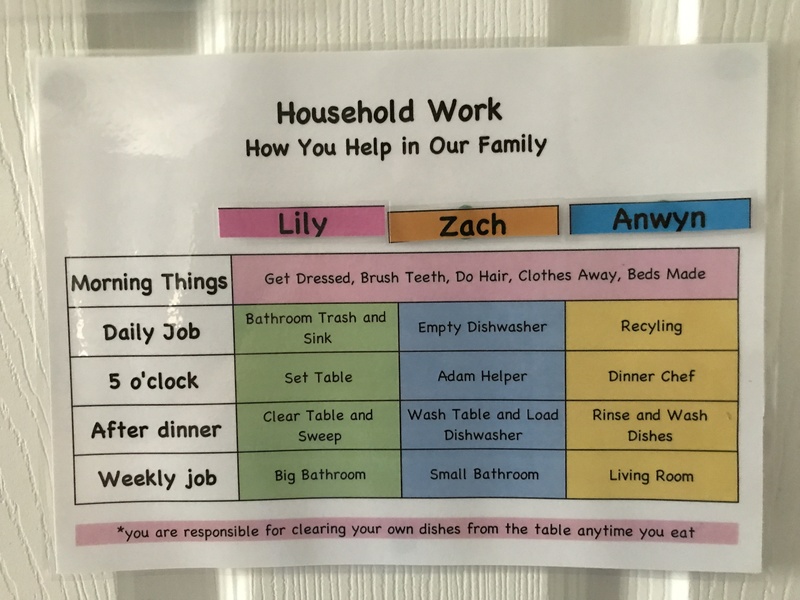 The Household Work chart is simply our chore chart, and includes 5 sections. Chores are rotated weekly (I just move the names around on the chart). Morning Things are the typical get ready for the day tasks: get dressed, brush teeth and hair, make your bed, make sure your clothes are put away. Each child does this everyday. Each child is given one Daily Job: empty bathroom trash and wipe down the sink, empty recycling, or empty dishwasher. My kids have been doing these tasks for a while now and are comfortable with each of the tasks. I am changing things up for our 5 o’clock Jobs (this used to be table jobs, and each child was in charge of one aspect of setting the table-plates, forks, or filling water cups). In our new system, one child is the dinner helper–they help me with meal preparations, and they get to give input on the menu for the week. One person is in charge of setting the table. One person is in charge of keeping the two-year-old brother Adam happy and out of trouble. We have tried After Dinner Jobs in the past, but haven’t been very successful. It is often easier for me to just do the dishes, but I am finally ready to spend the time teaching my kids how to clean up after a meal. One person will clear the table and sweep the floor, one person will wash the table and load the dishwasher, and the other will rinse and wash dishes. Weekly Jobs are once a week, usually on Saturdays. We have two bathrooms, and a living room, so each child gets one room. They have already been doing these jobs for a while and are fairly independent. 30 minutes of exercise (before 9 a.m.): The Florida heat and humidity keeps us mostly inside (except when we are at the pool), so it is important to get moving outside before it is too hot. The kids like ride bikes or rollerblades, or we will run/walk a few miles. Scripture study: Lily and Zach each have a goal to read The Book of Mormon this year. Anwyn has her own scripture study goals. Piano practice (20 minutes a day): I teach piano lessons year-round, and summertime is the perfect time to make progress. Workbook pages: I ordered these Summer Brain Quest workbooks for Zach and Lily. They add stickers to a map when they complete their tasks, and the material is pretty engaging. It will keep them thinking. As a rising seventh grader, Anwyn has a school assignment to work on, or she will find other things to learn and review. Memorization: we work on memorizing Articles of Faith or scriptures that we study at Family Home Evening. There are two other sections on the Daily List page. The Healthy Eating section gives space to keep track of the number of fruit and vegetables and sweet treats eaten each day (hopefully the fruits and veggies will far outnumber the treats!). I included this section to encourage the children to be mindful about what they are eating each day. The last section is a Family Time Report. This is something new that I am trying. Our children need some practice speaking in front of people, so this will be their opportunity to present something that they have learned or worked on or read that day. You may notice that I don’t have any reading time on our list. My kids are avid readers, and getting them to read is not hard (really, the effort is to get them to do something besides reading!). 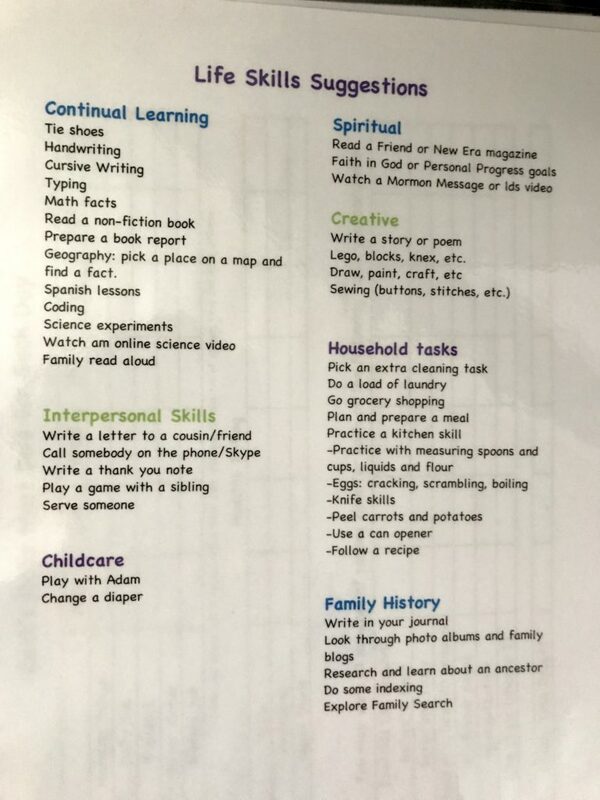 By now, the question you may be asking is “how do you get your kids to actually do the list?!”. The biggest motivator for my children is getting screen time (xbox, movies, computer games, etc). 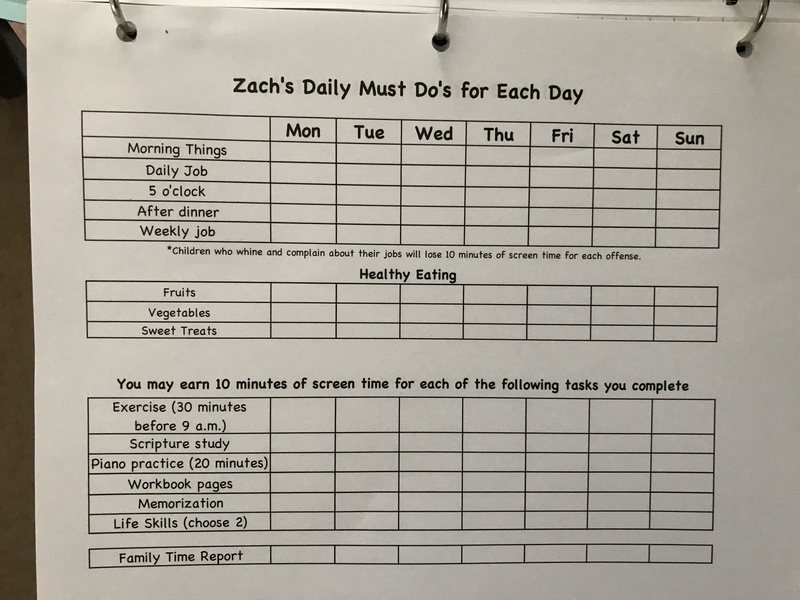 The question I hear from my kids everyday is “When do we get screen time?” And the answer is “When you have finished your list.” My children will earn ten minutes for each item they complete on their Daily list, for a total of 60 minutes. If there is whining or complaining about their jobs, then they can lose screen time. Screen time if not used cannot be used another day. Screen time must be finished by 5 p.m., to prepare for dinner and allow for family time after dinner. Completing the list should really only take 1-2 hours, and the rest of the day is open for other activities like going to the pool, playing with friends, etc. Feel free to download the lists I created here: 2017 Summer List (includes the chore list and the daily must do’s). This is what I have planned for our summer, and I’m sure I will end up tweaking it overtime. Over the years I have had a lot of different versions of the daily list. See the 2015 version, the 2014 version , the 2011 version, and the 2009 version (when my kiddos were just itty bitty!!). We watched it as a family last night on Sunday, and it is powerful. Today for Family Home Evening we will learn more about the eight Principles of Peace that are featured on Mormon.org. I love the videos that are posted for each principle (many of them brought tears to my eyes as I viewed them), but I think some of the content would be a little over the heads of my children. So tonight we will use a good old fashioned easter egg hunt to learn about the principles. On the mormon.org website you can find corresponding scriptures for each principle. I will put each scripture in an egg for the children to find. As we open them we read the scripture and discuss as a family. If you want to view the scriptures are all in one place, I have compiled them below. He offers peace to all who follow him. He lived, died, and lived again, so we may all live again. His resurrection brings us peace, now and forever. He is Jesus Christ. King of Kings. Lord of Lords. Prince of Peace. Sometimes my children are afraid in the night time. Sometimes I am afraid in the night time! It can happen to us all. 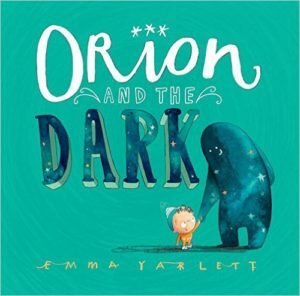 We recently came upon two books that helped to put the scary dark and night sounds into a more positive view. 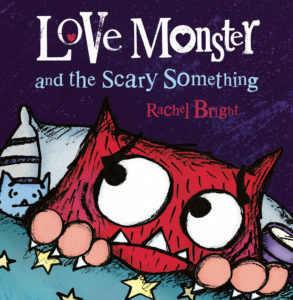 Definitely worth a read to any child! January to me means snow. Unfortunately, we don’t get any snow in Florida, so instead I try to fill my need for snow by reading about it! This year I discovered two more snow books to add to our January reading list. Our family is planning a major road trip this summer: 19 states plus Ontario in 15 days! To keep everyone happy, I have been collecting ideas and activities from all over the web. You can check out my Road Trip Pinterest board here. Here is what I have planned and organized so far. These are all ideas that I am using for my children ages 6, 8, and 11. My 14 month-old is a whole different story, but my plans for him will be saved for another day. National Geographic Kids United States Atlas: I purchased this a month ago to help us get to know the states that we will be visiting. It will come in the car as a reference guide to help the children answer their state activity worksheets (see below). Each child picked out a new coloring/activity book. These Extreme Dot-to-Dot books are a great challenge for my 11-year-old. We have been a fan of the Color Counts Color by Number books for years, and my 8-year-old picked this one. We are trying something new for my 6-year-old, the Usborne Big Maze Book. It looks really cool. I will use a clear laminate sheet to put over the mazes, then Zach can use a dry erase marker to do the mazes multiple times. Each child gets a 1″ binder to keep all of their activities. The binder can function as a hard writing surface. Binder coversheets (to make it pretty and fun) can be found here (let’s go on an adventure) and here (travel kit with cute cars on a road). A blank map of the USA. Children can color each state as we drive through it. 100 Would You Rather Questions: I will keep this in my binder, to use as conversation starters. State Activity worksheets: We will be traveling through states that we have never been to before, so we are going to spend some time learning about them. I am putting together a basic worksheet for each state. The children can log the date that we visit the state, and how many miles we travel. Each page also includes a place to fill in basic state facts (capital city, flower, tree, animal, etc), some fun facts, the state flag, and something to color from these cute state doodles. Blank Looseleaf pages: I will encourage my children to keep a daily journal. They can write, or draw pictures of our adventures. Hole punch a manilla envelope or use a sheet protector: it will be a place to keep attraction brochures and ticket stubs. A pencil pouch: keep writing and coloring supplies contained. We prefer to use twistable color pencils so we don’t have to bother with sharpening pencils. Games and Activities: insert these pages in a sheet protector, and use with dry erase markers. Then they can be used over and over again. Map to play the license plate game. You can mark off the state name on the list, or find the abbreviation on the map. Hidden Pictures/Seek and find sheets: three pages, with a summer desert, beach, and camping theme. More printable games from Ucreate: hangman, maze, rainbow car game, ABC road game, etc. Brain games that require no supplies: 20 questions, color car counting, alphabet (or number) spot-it, going on a picnic, etc. Here is a great printable list of games. Crossword Puzzles and word searches for each state: my 11-year-old daughter used this site to create personalized activity sheets for each state. Handheld devices/Movies. Use them when you need to. Enough said. Audiobooks: check them out from the library, or try Audible. First up on our list to try is The Hobbit. Good music: We created a road trip playlist for our iPod. Each person in the family gets to pick 10 songs to include. Ribbon mileage tracker. Pin a ribbon along the inside of the van, with mileage increments pre-marked. Use a clothespin to move along a car marker to mark your accomplishments. Another 100 miles finished! Celebrate a mileage marker with a joke. Put a stash of jokes in an envelope and let each child pick one to read aloud. Small toys: Shop the house or visit the dollar store. I will try to have one small item for each day. Stickers, small animals, squishy balls, silly putty, etc. Pipe cleaners: string cheerios or froot loops on them for a snack. Bend them into creations. Sticky note pads: draw on them, stick them on the windows, etc. Squiggle drawings on index cards: add a line, circle, or loop to a white index card and let the kids come up with what it might become. Reusable sticker books/Window clings: we already have these books that haven’t been used for awhile, but they are great fun. Mileage tracker: keep track of how many miles we drive in each day, and how many miles we drive in each state. Conduct an experiment: what is the most common vehicle color? Make a hypothesis, collect data, report results. Find a rock in each state. Use a sharpie to write the state abbreviation and the year on it. Pressed pennies: My kids have been collecting these for years, they are inexpensive and make a great souvenir. Do a google search for “pressed penny” and the name of the state you are a visiting to see a listing of locations. Each child will have a clothespin clip, decorated with their initial. The clips go on the front visor and stay up for good behavior. Whiny, complaining, disagreeable behavior brings the clip down, and they miss the next fun activity. We went to the craft store and each child chose a pack of stickers. Good behavior will be rewarded with a sticker at regular increments (every hour or 60 miles or 100 miles, etc). Whew! That is a big list. What are your best tips for road trips? The General Women’s Session of the 2016 April General Conference was inspiring and motivating. Each of the speakers addressed the need to reach out to others in love and service. I am prayerfully studying these messages and seeking the Lord’s help to be a better tool in his hands. Here are some of the key messages from the talks that I want to highlight and remember for myself and my family. Sister Cheryl A. Esplin, “He Asks Us to Be His Hands”. Be someone who reaches out to know and serve others–throw away the mirrors and look through the window. I have come to know that it is the love of God and neighbor that give meaning to life. May we follow our Savior’s example and His admonition to reach out to others with love. Women and sisters, what shall we do? We build the kingdom when we nurture others. Love is making space in your life for someone else. We also build the kingdom when we speak up and testify of truth. Sister Linda K. Burton, “I Was a Stranger”. There are more than 60 million refugees, including forcibly displaced people, worldwide. Half of those are children. The First Presidency invited individuals, families, and Church units to participate in Christlike service in local refugee relief projects and to contribute to the Church humanitarian fund, where practical. Each member of this worldwide sisterhood has covenanted at baptism to “comfort those that stand in need of comfort. With these truths in mind, we have organized a relief effort called “I Was a Stranger.” It is our hope that you will prayerfully determine what you can do–according to your own time and circumstance–to serve the refugees living in your neighborhoods and communities. This is an opportunity to serve one on one, in families, and by organization to offer friendship, mentoring, and other Christlike service and is one of many ways sisters can serve. President Henry B. Eyring, ” Trust in That Spirit Which Leadeth to Do Good”. The feeling of greatest importance is love. A second feeling you have had tonight was the influence of the Holy Ghost. “And now, verily, verily, I say unto thee, put your trust in that Spirit which leadeth to do good–yea, to do justly, to walk humbly, to judge righteously; and this is my Spirit” (D&C 11:12). The third feeling you have had tonight is that you want to be closer to the Savior. The first thing you must commit to do is to go and serve, knowing that you do not go alone. When you go to comfort and serve anyone for the Savior, He prepares the way before you. The second thing you must do is remember the Lord as you go in service for Him. The third thing I hope they will do is to be personally modest about their good works. My prayer for the sisters in the kingdom, wherever they may be or in whatever circumstances, is that their faith in the Savior and gratitude for His Atonement will lead them to do all they can for those God asks them to serve. As they do, I promise that they will move up the path to become holy women whom the Savior and our Heavenly Father will welcome warmly and reward. I witness that we grow closer to the Savior as we, out of pure love, serve others for Him. I started writing this post prior to conference weekend, but after a week with a sick baby and then a birthday and other “normal” life things, I was never quite able to finish this post. So here it is, after the fact. Maybe it will help you prepare for the next semi-annual conference. Most of my children are at an age now where they are able to occupy themselves better during and between sessions (age 11, 8, and 6). Except for the almost one year old baby. We just try to keep him happy and take him outside and for walks. I quickly realized that I would not be taking any notes this time around, but I will have plenty of opportunities to study the messages on my own in the days and months to come. This time around I am just focused on making sure we have a peaceful spirit in our home. That being said, here are a few resources I am using this General Conference weekend. Conference Journals: Each child has their own notebook for taking notes. My oldest daughter decorated a notebook at Activity Girls specifically for this purpose, while I just found some nicer journals for Zach and Lily that we already had at home. We encouraged them to write the name of the apostle, and any key words that they heard. 7-Up Lifting Ways to Get the Most out of Conference: I snagged this cute printable, attached to a can of 7-Up, and shared with the sisters I visit teach. Getting to know the apostles: I printed and laminated these Special Witness cards to help my children learn and recognize the faces of the apostles. On Sunday the children used the General Conference binder, full of activities like word searches, mazes, apostle facts and trivia. I keep all of the pages in sheet protectors, so they can be re-used with dry-erase markers. You can read more about it here. These religious doodles are kind of fun to color! Counting Down to Conference: I forgot to do this time around, but I am holding on to this idea for future sessions! Check out this post from last fall which details all of our General Conference traditions. The Monday before General Conference we traditionally have an FHE lesson focused on the importance of following the prophet and preparing for General Conference. This time around we focused on the following teachings about prophets from the October 2015 General Conference. And make no mistake about it: the Lord directs His Church through living prophets and apostles. This is the way He has always done His work. There is safety in following the word of the Lord through His prophets. God called President Thomas S. Monson, the counselors in the First Presidency, and the members of the Quorum of the Twelve Apostles as prophets, seers, and revelators. In this world of increasing fear, distraction, adversity, and anger, we can look to them to see how disciples of Jesus Christ—filled with charity—look, sound, and react to issues that could be divisive. They testify of Jesus Christ and respond with charity, the pure love of Jesus Christ, whose witnesses they are. I had the opportunity to teach the lesson in my ward Relief Society today. The focus of my lesson was adapted from President Dieter F. Uchtdorf, “Of Regrets and Resolutions” (October 2012). Here are some of the highlights. I would like you to reflect for a moment, and reflect personally on your own life. If you knew that your death was imminent, how would you answer that question? Do you have any regrets? (Give a minute to ponder this). In his conference address from October 2012, “Of Regrets and Resolutions” President Uchtdorf discussed the top three responses to that question. When this life ends and we pass onto the next, the only thing we take with us is the knowledge that we have gained, and the meaningful relationships that have enriched our lives. How we treat others, the love and kindness we offer, is what is most important. Monday is usually my day to recover from the weekend and get the house back in order. This week, among the usual tasks of laundry and dishes, etc, I worked on sorting through my baby boy clothes that Adam has grown out of, so that I could pass them along to a sister that has a new baby boy. I had to work quickly, since 10-month old Adam was at my side, pulling items out of the box almost as fast as I was putting them in. I got the box ready to go and planned to deliver them that day, but by then it was lunchtime for Adam and myself. After feeding Adam, I mixed up a batch of granola to go with the smoothies I had planned for after school snack. The granola was in the oven and I started to work on the lunch (and breakfast dishes), but by this time Adam wanted some attention. I sat down with him and read him a few board books. Once he happily crawled off my lap, I turned my attention to the laundry that had just finished drying. I put the sheets on the bed, but then the timer beeped for the oven-baked granola, before I could put away the rest of the clean towels and cloths. I had hoped to deliver the baby clothes that day, but it was now time to load up the baby for the walk to the bus stop and meet my big kids. Once they get home it is whirlwind of activity as I balance the needs of four children: snack, chores, homework (27 spelling words to practice! ), piano practice for all three, a lesson for me to teach, trying in vain to get the baby to take his afternoon nap, prepare dinner, eat, FHE (thankfully it is Jared’s turn for the lesson, and truthfully I snag a two-minute doze on the couch while he engages the children in an activity). By the time the kids are washed and read to and in bed, I walk past the clean laundry that is still sitting half-way out of the dryer and spilling onto the floor, and the dinner dishes that aren’t finished. I focus on dishes, in between comforting my five-year-old son who is having trouble sleeping because of a knee that he fell and scraped earlier in the day. At 10 p.m. I crawl into bed with him until he is sound asleep, leaving the laundry for yet another day. “I think of our Lord and Exemplar, Jesus Christ, and His short life among the people of Galilee and Jerusalem. I have tried to imagine Him bustling between meetings or multitasking to get a list of urgent things accomplished. Eventually the laundry and dishes will get done. I may not be crossing off many things (or anything!) on my to do list, but as I hold my napping baby in my arms, as I help my eight-year-old with her math problems, as I read a book with my five-year-old, and as I teach my 11-year-old how to cook something in the kitchen, I remember that “this is what God gave you time for”. The relationships I have with my children and spouse are what is most important. Another regret people expressed was that they failed to become the person they could and should have been. They realized that they never lived up to their potential. President Uchtdorf is clear. He is not speaking of “climbing the ladder of success in our various professions”. We don’t need to be the most famous author, the most successful businessperson, or the scientist who discovers the cure for cancer. Instead, he is “speaking of becoming the person God, our Heavenly Father, intended us to be”. “Let us resolve to follow the Savior and work with diligence to become the person we were designed to become. Let us listen to and obey the promptings of the Holy Spirit. As we do so, Heavenly Father will reveal to us things we never knew about ourselves. He will illuminate the path ahead and open our eyes to see our unknown and perhaps unimagined talents. The last regret that we will focus on is this: “They wished they had let themselves be happier”. Each day is a gift. What do you do to find joy each day? The month of February always turns our minds and hearts to the theme of love. At our house we read love books, we read scriptures about love, and we write love notes. So I have been thinking a lot about the topic of love. “Real love is best shown in the “how”. How do we show our love? We can begin first by saying “I love you”. We have an “I love you” tradition at our home that is centered on sneezing. When someone sneezes, the first response, as is typical, is to say “Bless you”. But sneezes tend to come in multiples, so after the second sneeze the response is “Oh, I love you.” Sneeze again and it is “Oh, I really love you!”. This tradition started with my husband I when we were first married, and has now grown to include our children. The children usually continue the conversation with fake sneezes. I then respond: “Oh, so much love!” and “Lots of love!” and “Hugs and kisses!” and “Loving you forever!” This is just a silly little thing, but it gets us saying the words. … when was the last time you took your eternal companion in your arms and said, “I love you”? Parents, when was the last time you sincerely expressed love to your children? Children, when was the last time you told your parents that you love them? I loved that thought so much that it has been hanging in my bathroom for almost two years. I need that daily reminder of how to act! “You are loved. You are dear to your heavenly parents. The infinite and eternal Creator of light and life knows you! He is mindful of you. Yes, God loves you this very day and always…He knows everything about you. He sees you clearly—He knows you as you really are. And He loves you—today and always!…He loves you not only for who you are this very day but also for the person of glory and light you have the potential and the desire to become”. I felt his spirit; I believed him; my spirit soared to a new height. David A. Bednar, “More Diligent and Concerned at Home”. October 2009 General Conference. Jeffrey R. Holland, “How Do I Love Thee?” BYU Speeches, February 15, 2000. Thomas S. Monson, “Love—the Essence of the Gospel”. April 2014 General Conference. H. Burke Peterson, “The Daily Portion of Love”. 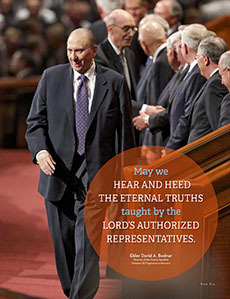 April 1997 General Conference. Joseph B. Wirthlin, “The Great Commandment”. October 1997 General Conference. Dieter F. Uchtdorf, “Living the Gospel Joyful”. October 2014 General Conference.